1 What are Automated Fire Curtains? 2 How do Fire Curtains Work? 3 What’s the Difference Between Fire Curtains and Fire Shutters? 4 Where Should You Install Fire Curtains? What are Automated Fire Curtains? Automated fire curtains prevent the spread of fire by blocking its path. They are made from extremely fire-resistant material and they descend to form a protective barrier in the event of a fire. Fire curtains can provide up to 2 hours of protection, giving the fire service more than enough time to respond and extinguish the fire before it spreads any further, causing greater risk to life and property! In some cases, fire curtains can slow the fire down so much that it runs out of fuel or ample oxygen. In these cases, the fires gradually extinguish on their own. How do Fire Curtains Work? Most people know how fire extinguishers work — although it’s actually a little more complicated than you might think — but many people don’t understand how fire curtains work. So we’d like to explain it simply here. Fire curtains are proven lifesavers because they can greatly impede the spread of a fire. They are installed with automatic machinery that activates and deploys them in the event of a fire. This activation is triggered by some kind of fire alarm of your choice. Once the alarm has been triggered, the curtains will be lowered down, creating a barrier which the fire cannot spread past. Without more fuel to burn, there is even a chance that the fire will burn itself out before the 2-hour limit is depleted on the fire curtains. Your fire curtains close partly and then wait for a certain period of time before closing the rest of the way. These different options are there to suit different businesses’ needs, as some may need a longer period of time to ensure all of the staff don’t have to push their way under the fire curtains when they exit in the event of a fire. 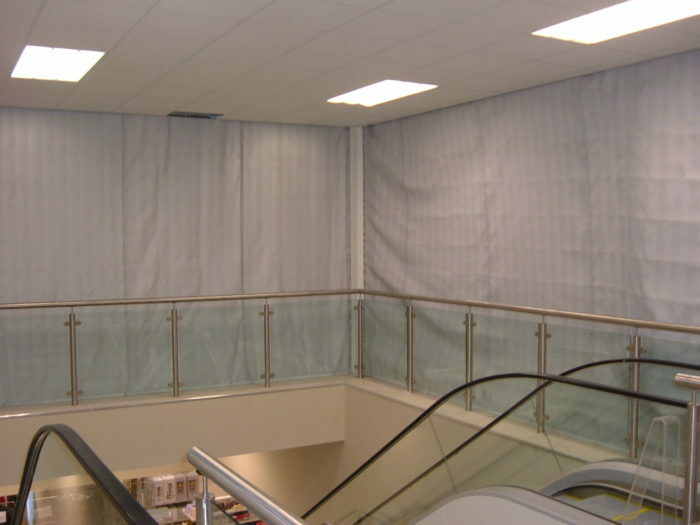 Other businesses may need their fire curtains to activate instantly, either to protect life or valuable assets. What’s the Difference Between Fire Curtains and Fire Shutters? The biggest difference between fire curtains and fire shutters is the material, as fire curtains are made from flame-resistant fabric whilst fire shutters are made from metal links. Fire curtains are much easier to install, and their lightness makes them less bulky. However, fire shutters also provide additional security as they are strong enough to impede anyone trying to break into your premises. So, fire shutters can have a duel purpose, in this respect. Where Should You Install Fire Curtains? We’re often asked where the best place to install fire curtains is, but this depends on your premises, the potential fire risks, fire escape routes, and if there are any areas with valuable equipment or high concentrations of people. If your workplace in a relatively standard office space, for example, it may make the most sense to install the fire curtains outside the kitchen, server room, or printer room, as these areas are all much more likely to catch fire because they have heat sources and ample fuel. Installing fire curtains just outside one of these rooms could help restrict the fire to a very small area, limiting the danger to life and the damage to property. If your workplace is a factory or it has some kind of heavy machinery, it may make more sense to install a fire curtain around the perimeter of your storeroom or any other room that is particularly valuable. With this strategy, rather than trying to predict where a fire is most likely to ignite, you are simply protecting the most valuable areas of your business should a fire occur. The best place to install automated fire curtains differs from business to business, so we will be more than happy to offer you advice and a free quote, should you need a little help figuring out the optimal set-up for your automated fire curtain installation. We hope this blog post has answered a few questions you might have about fire curtains, and if you’d like to know some more specific information, make sure you visit the automated fire curtains page. If you have any questions for our fire-safety experts here at K & D Systems, please don’t hesitate to get in touch.